The opticalight app turns your mobile device into a candela meter. Please contact opticalight for a current app version. It measures the luminous intensity; that is, power emitted by a light source in a particular direction, weighted by the luminosity function. The application converts your photos into false color pictures or videos with a calibrated candela per square meter spectrum. It’s developed for designers use and specialised for artificial light situations. The opticalight application will be calibrated for a few common mobile devices at the beginning. More functions to simplify panning and construction of projection installations will be developed. new opticalight projectors are developed and will be available from 2016. HCI Projector >4’500 lumen output with 30°- 60° lenses and mutable light distribution. Easy planning and construction of projection installations, as well as optimal support of lighting designers, public services and electricians on side is our ambition. Therefore, opticalight offers diffrent planning tools, which are constantly developed and adapted to diffrent situations and needs. 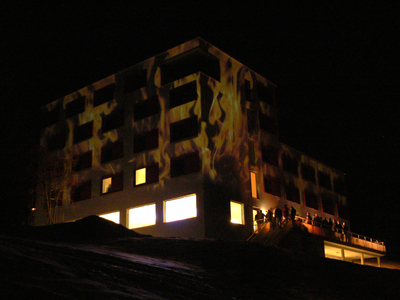 Animated projection (15min loop) on the main building of the Zurich University of the Arts in the context of the annual exhibition 2009. Light-simulation regarding light intensity and light distribution, using the historic centre of Lucerne as a model. The KTI Follow-Up Project “Urban Space Modulation” was initiated in order to gain new insights into the utilization of the light projection method in urban space. In the context of the “Plan Lumière” project of the city of Zurich, all building facades on the lower right bank of the lake of Zurich, the Utoquai, were illuminated. 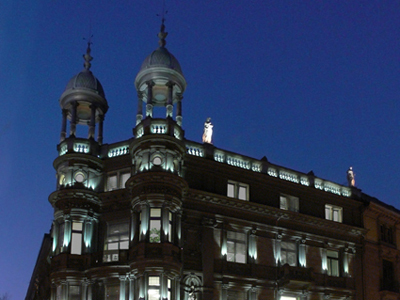 In spite of the differing lighting designs of each building, an overall appearance was achieved. The installation shall be run permanently as of Summer 2009. The range of objectives concerning lighting in public space has changed continuously over the past years. 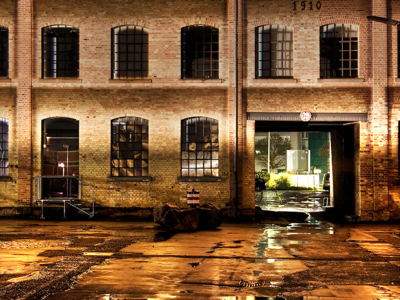 The purpose of urban light ranges from spatial orientation in the dark to granting of (transport) safety to creative tasks in regard to urban space by night. In addition, the construction and implementation of lighting systems nowadays need to meet economical, energetic and ecological criteria. The range of responsibilities concerning light planning is changing. It is no longer concerned with the cityscape as a sum of individually illuminated buildings but with the object as part of an overall concept. The projection method is ideal for a uniform lighting with only minor contrasts in the projection power. As the building is initially flooded with full power and the areas to be shaded are covered subsequently, high-contrast accentuation is not reasonable from an energetic perspective. A combination of illumination elements according to the multiple lights method broadens the creative scope. Picture 2: Advantages of both methods. 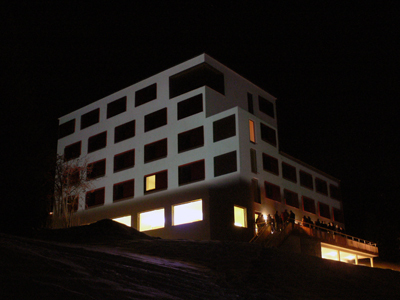 Area with projection, accentuation through installation of lights on the facade. 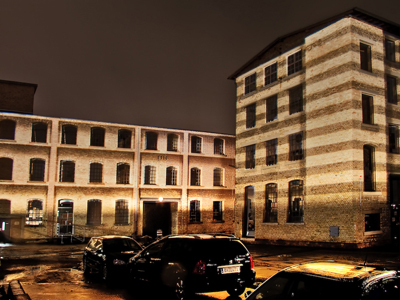 Animated illumination (10min loop) with ongoing changes of lighting effects, textures, patterns and materials at one building of the factory area. Due to its accurate control of light distribution, the projection method can have a strong influence on the architectonical effect. The brightness of materials can no longer be distinguished from light projection. By manipulating light effects, perspective alienations can create spacial situations which diverge strongly from the effect they create during daytime. Horizontal material changes and simulation of a corner tower on the right-hand side of the building. 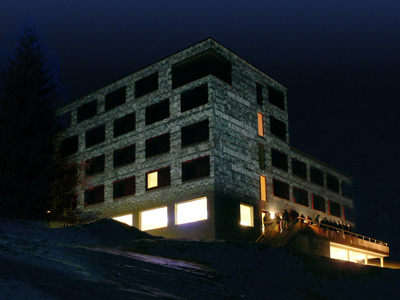 Shadow projection of a modulated facade in the background. 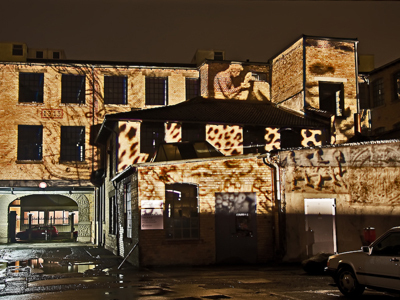 Both projected onto flat brick facades. Illumination simulation regarding light perception. In the context of a workshop with students of the University of Applied Science North-West Switzerland and the Zurich University of Arts. 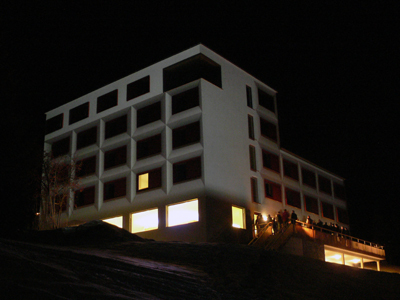 Grand opening of the hostel. 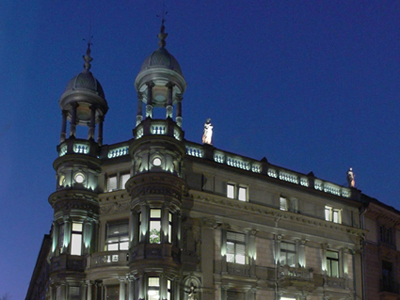 Lighting, structure and material effects, as well as alienation of the building.